The Piper PA-30 Twin Comanche was designed as a twin-engined variant of the Piper PA-24 Comanche. A light twin engined aircraft, with retractable landing gear, seating 4 (in original models) to 6 (in later models), and cruise speeds ranging from 160-210 mph on two 4-cylinder 160 hp (120 kW) Lycoming IO-320-B1A fuel injected engines. Twin Comanche engines have 2000 hours between overhauls and have developed a reputation for reliability. The Twin Comanche was produced on the same Lock Haven, Pennsylvania production line as its single-engined stable mate but production ended when the factory was flooded in 1972. The Twin Comanche is a low-wing cantilever monoplane with a retractable tricycle landing gear. With tip tanks, the aircraft holds 120 gallons (454 l) of fuel. Fuel burn at typical cruise settings is approximately 16 gph (58.7 lph) with a cruise speed of 165 kts and it easily climbs to 18,000 feet (5,500 m) when required. Total sales of all PA-30 models came to 2,000 aeroplanes. The big draw was the plane’s ability to extract maximum speed from minimum horsepower and fuel consumption. – Powerplant: 2 × Avco Lycoming IO-320-B1A flat-four piston engines at 160 hp (120 kW) each. – Windows 7+ or MAC OS 10.6(or higher) or Linux. 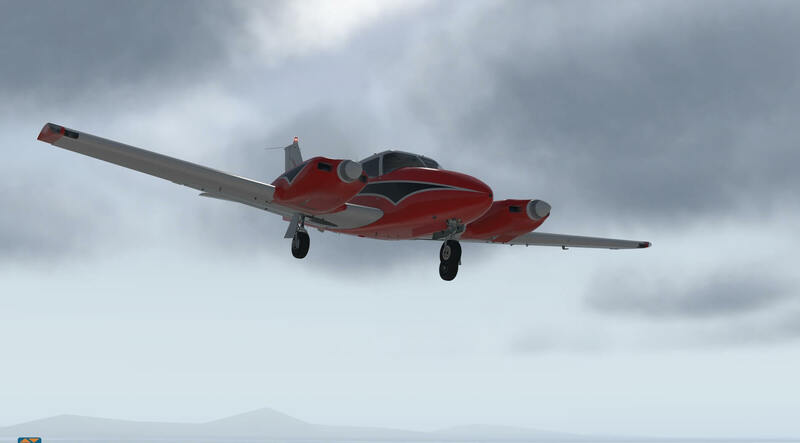 The download was straight forward, as was establishing the model in to the extra aircraft folder in X-Plane 11. 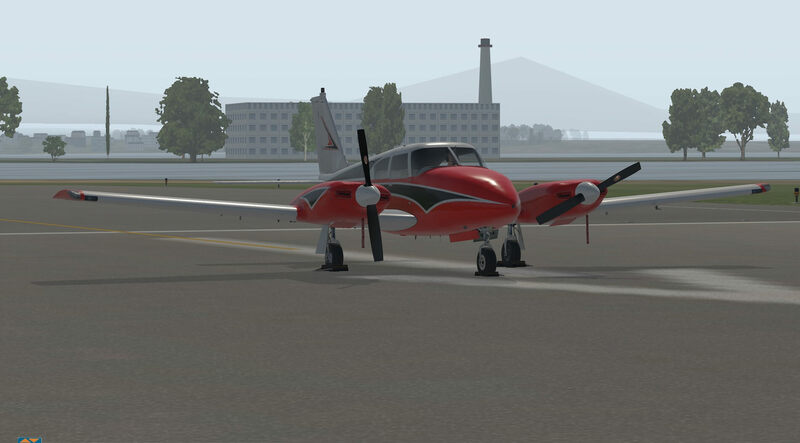 Please note this model is not compatible with X-Plane 10 and has been designed specifically for X-Plane 11. 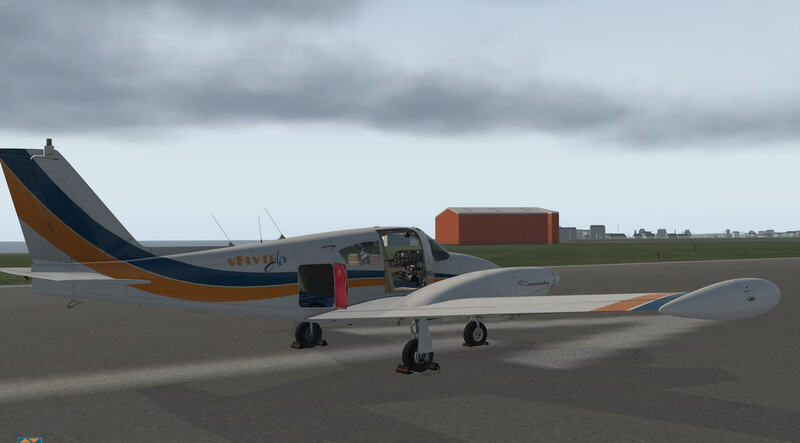 Also this is version 1.2 of the model as vFlyteAir have already updated the original release. The documentation folder contains a change log which lists the changes of the various versions and updates of the model and a very useful manual in PDF format. vFlyteAir should be commended as this manual is detailed and helpful for users of all levels and includes a section which outlines all technical data for the aircraft. I will use this manual as the basis of this review. 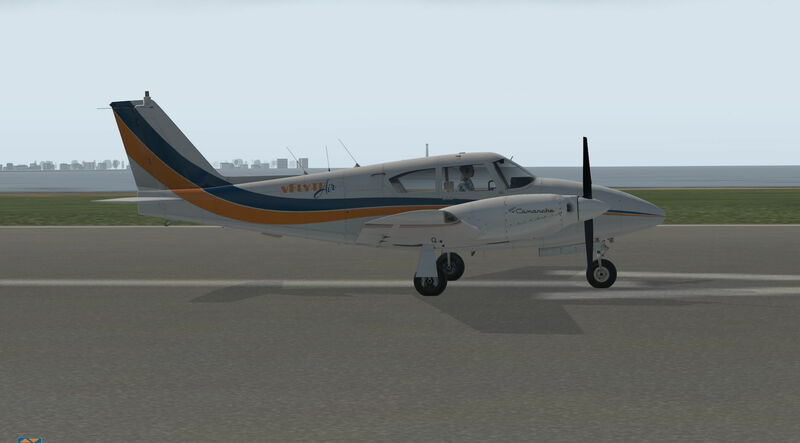 And: Custom HDR interior and exterior lights with custom strobe flash sequence; Custom 3-D Propeller Effects with Prop Feathering; 12 Extra Hi-Res Liveries Included – and a custom Paint Kit is available for download so you can create your own livery. Fuel truck locations are set for the Twin so that you can call for Ground Service in X-Plane 11. The aircraft is great for inexperienced pilots as once it is loaded with engines running it can be used for straight forward flight. All instrumentation is labelled and these can be read by hovering over the specific control, switch or dial. There is plenty of power for the climb and handling is very stable and responsive. The visibility from the cockpit is good and the controls are clear and easy to use. The user manual explains that as this is a model of an earlier aircraft it has no ignition key when loaded with engines off. It goes on to explain that the engines are started with rocker switches on the pilot side of the cockpit with fuel switches in between the pilot and co-pilot. The guide to starting the engines is included in the user manual with clear and straight forward text and good illustrations to boost the confidence for those who have not tried loading with engines off before. 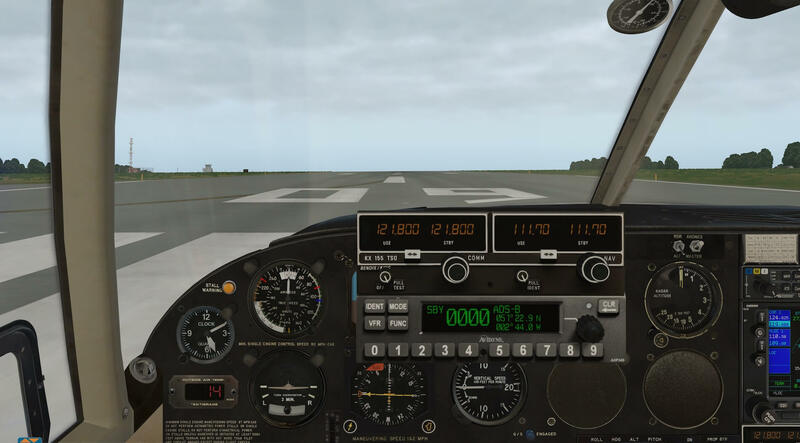 Following the guide to create an engine start is easy, especially as help comes not only from the user manual but also from on screen prompts which are very helpful for the less experienced pilot. The user guide highlights the fact that the real fuel tanks of the PA30 have been modelled. This means that the fuel tanks do not cross feed and the pilot needs to manage the fuel to ensure the fuel does not run out. The guide shows how this is done both in text and screen shots. The user guide then takes the pilot through taxi and take off, use of the on screen power table, cruise descent and landing. The model flies well without these procedures but following them and attempting to set everything for optimum performance creates greater realism and greater challenge! The introduction to the user guide outlines the fact that the team worked with a CFI in preparing the model. The CFI suggested the team model the emergency landing gear deployment and this is explained in the guide. The modelling for this works well and a simulated failure or just using the emergency gear deployment certainly gives the pilot plenty to think about. The user guide explains that the model is based on a specific aircraft with serial number 30-459 and tail number N92NE which is based in a rental fleet in Texas. The modelling is based on photographs and measurements from this aircraft. The hard work put in to modelling the aircraft certainly shows and appropriate wear and tear marks give the aircraft a used feel. The instrumentation is clear and remains so even when zoomed in. Several of the instruments can be “clicked on” and they pop out so they can be seem more clearly. This is good for all pilots as the readings are easier to see and also helpful to inexperienced pilots who don’t instinctively look in the right place. Many of the switches and instruments are labelled and the description becomes available by hovering the mouse over them. The manual includes a section on the instrumentation where screen shots are labelled to help identify the contents of the control panel. The yokes can be hidden, by clicking on the centre boss, to create a clearer view the control panel and can be re-established by clicking on the control panel where the yoke should meet. The Comanche has one door on the co-pilots side with a opening window on the pilots side. Having flown in a single engined Comanche, which is very similar in the cockpit, once in the pilots seat you know you are definitely in the aircraft. The pilots window and co-pilots door can be opened from within the cockpit by use of the handles. The door needs the top handle released before the door handle will open the door. The interior fabrics and textures are accurately modelled down to the detail of the screw heads and Piper rudder pedals. All the colours and textures used throughout the cockpit add to the experience and switches are modelled that allow the interior lights to be switched on and off for both pilots and passengers. 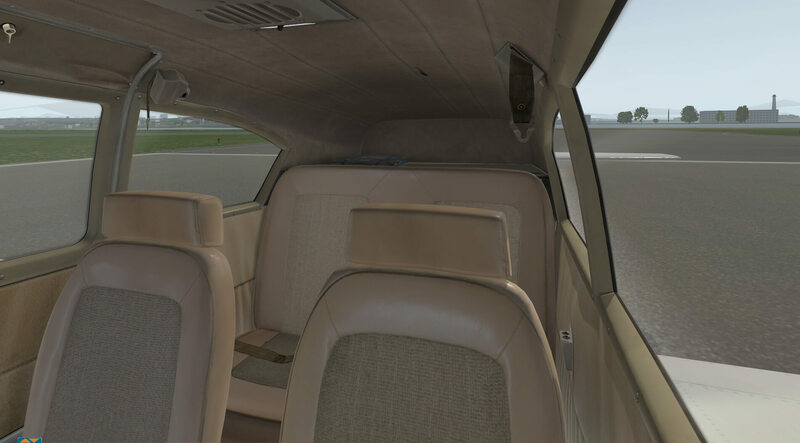 The cabin floor includes hatches for electrics and for the aforementioned emergency landing gear deployment and even the glove compartment can be opened. The fuel management switches can be operated between the pilots seats. Light and shadow work very well in the cockpit covering all movement and changes. The exterior modelling is crisp and clear with detail such as writing, lights and panels all clear whatever level of zoom is employed. All lights are bright and convincing. Control surfaces are reproduced in detail as are the undercarriage and when zoomed in the makers label is visible on the propellors. The hinges on the flaps and the aerials on the aircraft are produced very realistically. There are thirteen different liveries to choose from all adding a different character to the aircraft with bright vivd colours. Light reflections on the surfaces are accurate and reflections on the propellor hub change with movement. The panels are realistic with joins between them and the fixing screws clearly modelled. The figures modelled in the aircraft move independently when viewed from both outside and inside. When on the ground, with engines of, the aircraft can be viewed with wheel chocks and engine intake plugs in place. In flight the modelling maintains its integrity and the movement of control surfaces, undercarriage and the aircraft itself are true to life. The attention to detail for the exterior of the aircraft matches that of the interior and is of high quality. The quality is clear as a comparison with pictures of the real aircraft on the web shows no differences and the model has the character of the actual aircraft. The sound quality of the model is one of the aspects highlighted by vFlyteAir. The engine sounds are deep and rich giving a very realistic experience. The sound of the engines changes appropriately when the doors and windows are opened and closed or when the camera view is outside the aircraft. The switches and handles all have their own noises and when in flight the sounds are realistic and appropriate especially with the reassuring thump of the undercarriage and the movement of the flaps. The quality of sound of the model enables realistic control of throttles and control surfaces and compliments the high standard of visual modelling. The aircraft is supplied with so many menus and systems that there are separate sections of the user manual for the various options. 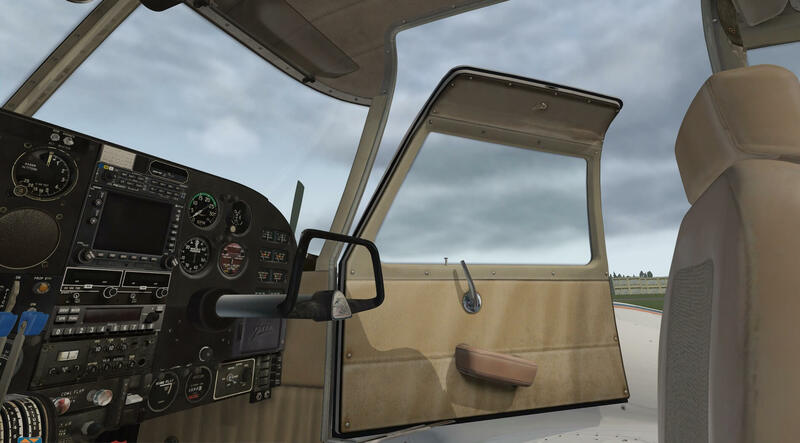 The aircraft can be flown without the use of these menus but all of them add to the experience, create realism and provide extra challenges for the more experienced pilots. The menus are accessed through two orange arrows in the bottom left of the screen and the manual gives full guidance on how to use them. The menus cover four areas Pre-flight, Weight and Balance, Check Lists and Power Settings. Pre-flight allows the introduction of wheel chocks, engine intake plugs, the control the co-pilot door and cargo door and the use of wing tip tanks. The menu also has on/off options for on screen notifications, engine start, nose gear control, checklists, passengers in views and hiding glass objects. The weight and balance menu encourages the pilot to make choices and decisions to create safe and stable flight. The menu is easy to interact with and understand. The menu allows for changing the occupants of the aircraft, catering for up to four people and setting their body weights, changing the amount and weight of luggage and setting fuel weight and balance across the various internal tanks and the optional wing tip tanks. The menu shows a centre of gravity chart and this alters as the menu changes are made. Another bar shows overall weight and turns red if the aircraft is overloaded. If fuel weight is changed in the menu it will also update the X-Plane weight and balance menu. If loads are changed whilst viewing the plane from outside it is possible to see the affect on the aircraft suspension. Changes in weight will also impact on take off, endurance and performance. The checklists menu provides four checklists for (a) Pre-flight, (b) Starting, Taxi and Run-Up, (c) Take off, Climb and Cruise and (d) Descent and Landing. The lists are selected by tabs at the bottom of the menu screen and can be used individually if the pilot does not want to use them all. Once started the items have to be cleared sequentially. Some items are self checking if the particular item has been completed whereas others require the pilot to physically check the box. 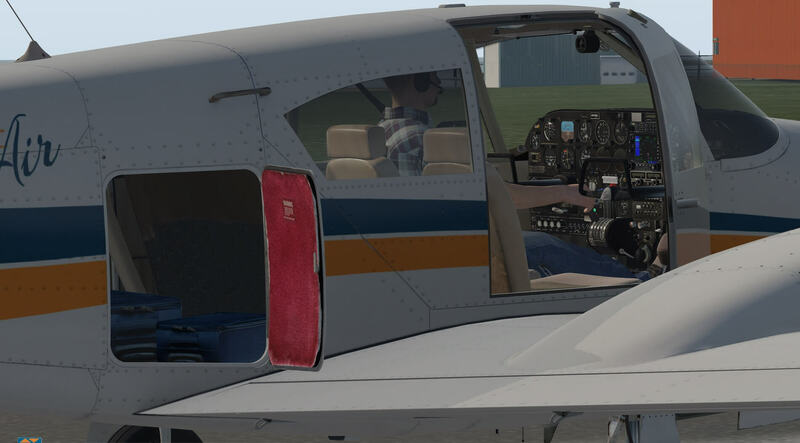 Whilst flight can be achieved without using the check lists they add considerable realism to the flight and encourage less experienced users to expand their use of X-Plane, carrying out correct procedures. Again the manual is really helpful in explaining what to do and how the checklists work. The Power Setting Table can be opened at any time and shows power against throttle settings and Manifold Air Pressure readings. This allows the pilot to fly in the most efficient manner and understand how hard each engine is working. The handbook assists with this as well as explaining the relevance of exhaust gas temperature. The autopilot is modelled on the AutoFlite 111 autopilot and the handbook explains this is because this is what was installed in early Pipers. The section in the handbook that covers the autopilot is clear and comprehensive. The autopilot can be used to maintain roll, pitch, heading, trim and altitude and in terms of lateral guidance it can govern heading, link to the Garmin 530 or switch to ILS mode. To link to the Garmin the autopilot should be set to Nav or Omni and the Garmin should be set to GPS. The model responds well to the autopilot and flight is controlled and smooth but responsive enough to react to weather conditions and turbulence. Inputting a flight plan in the Garmin 530 works in the same way as other X-Plane aircraft and the aircraft readily follows the route selected. Whilst some of this initially sounds daunting for an inexperienced pilot a combination of the handbook and practice makes the full use of these instruments possible. 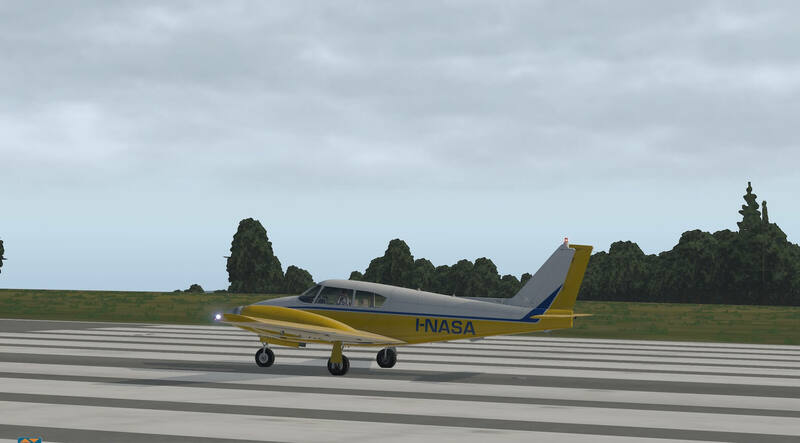 The handbook also covers the simulation of the Avidyne AXP340 Transponder modelled in the aircraft. On real aircraft this transponder would be sending position co-ordinates to ground stations and other aircraft ensuring the aircraft is safely identified and located. The transponder can also be set to display accumulated flight time, a stop watch to monitor actual flight time, flight ID based on the tail number for that particular livery. The monitor also shows pressure altitude and relate this in flight level format. As described in Wikipedia pressure altitude is the indicated altitude when an altimeter is set to an agreed baseline pressure setting under certain circumstances where the aircraft’s altimeter would be unable to give a useful readout of altitude. Examples would be landing at a very high altitude or near sea level in conditions of exceptionally high air pressure. Old altimeters were typically limited to show altitude when set between 950 mbar and 1030 mbar. “Standard” pressure, the baseline used universally, is 1013.25 hPa, equivalent to 1013.25 mbar or 29.92 inHg (inches of mercury). This setting is equivalent to the air pressure at mean sea level in the International Standard Atmosphere. Pressure altitude is primarily used in aircraft performance calculations and in high-altitude flight. The transponder can be set to measure a particular altitude and then display the aircraft altitude in relation to that figure in terms of feet above and below. 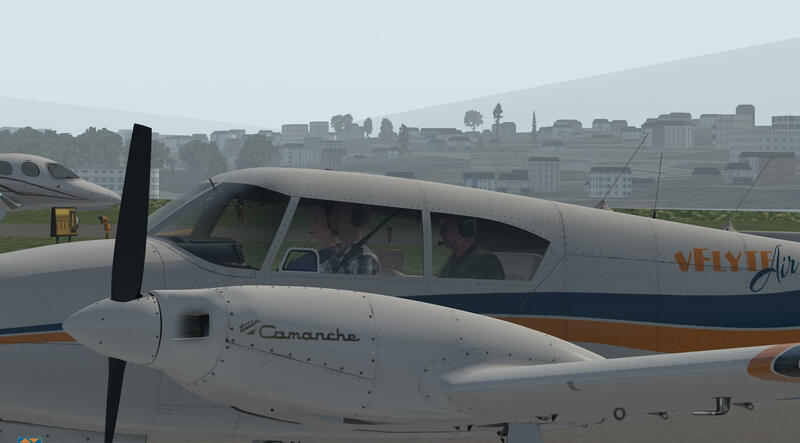 This model allows X-Plane to be used in a large variety of levels. Visually it is very impressive with clear, sharp graphics and impressive attention to detail. The sounds supplied are realistic and help immerse the user in the whole experience. This is a great aircraft to simply get in and fly and allows the user to appreciate the scenery and effects created within X-Plane. For the new pilot the handbook is very helpful with good clear diagrams of the instrumentation aided by labelling of many instruments by hovering the mouse. On screen warnings and advice are also there to help but the aircraft can simply be flown if required. Controls, levers and switches can be operated by the mouse, keyboard and joystick and respond as expected. 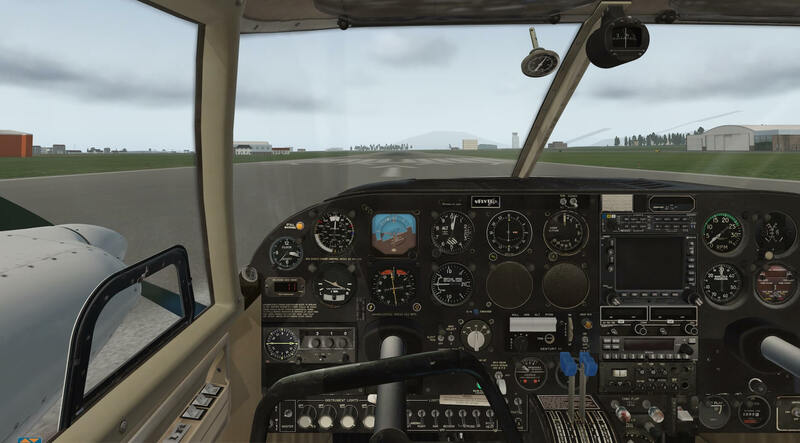 Once the basics of flight in the aircraft have been mastered the extensive menus allow the user to increase the realism of the flight in terms of planning, checks, weight and balance and performance management. Whilst this sounds a huge challenge for the new pilot it can be mastered with practice and adds to the experience. The fact the planes autopilot can be linked to the Garmin 530, and flight is steady and smooth, allows the user to practice changing fuel mixture, carry out in flight checks and thoroughly enjoy the experience provided by vFlyteAir. 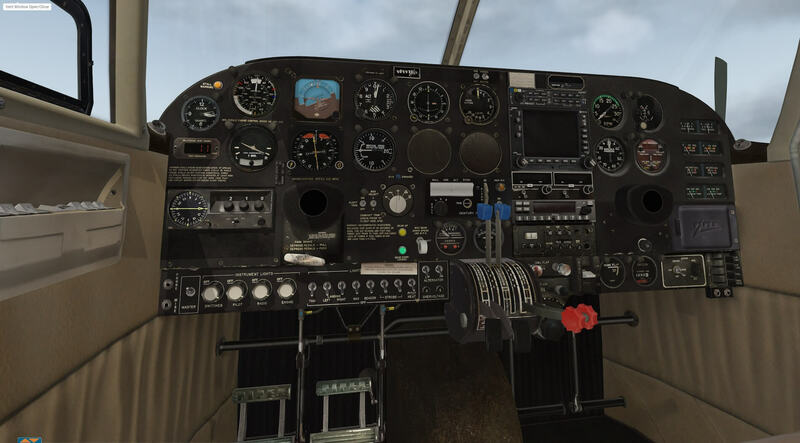 This model provides a great aircraft just to flyby when used to its full potential it allows the user to simulate many of the decisions and responsibilities faced by pilots. More information can be found at the dedicated vFlyteAir web page or at the dedicated X-Plane.Org page.